GAINESVILLE, Fla. — Florida Museum of Natural History researchers are planning to launch a new app that will allow users to interact with a projection of the Tree of Life designed by internationally renowned artist Naziha Mestaoui. The museum will host a “One Tree, One Planet” event in Powell Hall on the University of Florida campus April 8 from 6 to 8 p.m. to debut the app and show the interactive projection indoors. 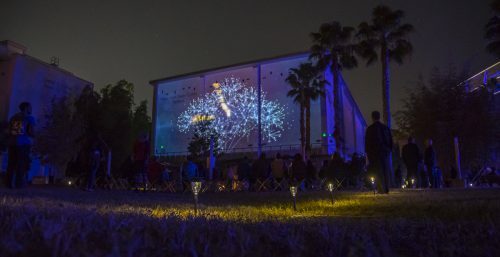 The museum premiered the “One Tree, One Planet” two-story projection in 2017 on an exterior wall of the Samuel P. Harn Museum of Art. The new app, supported by a gift from the 1923 Fund to the Florida Museum, will show attendees’ images simultaneously alongside others at the event on the Tree of Life projection. After the event, the app will offer users challenges to emphasize how small changes they make can add up to significant, positive outcomes for the future of our planet. The app aims to give participants a way to refer back to the projection’s message of interconnectedness and create a network of users supporting sustainable actions. The app will feature a variety of challenges, from choosing sustainable seafood options to planting native wildflowers. Users will be able to “level up” as they complete challenges and see how their accomplishments compare to others using the app. This feature aims to create a supportive network for users to help one another reach their goals. The artist, Mestaoui, is best-known for her “One Heart, One Tree” projection that first appeared on the Eiffel Tower during the United Nations Climate Conference in 2015. Her recent large-scale work with UF collaborators, “One Tree, One Planet,” is designed to illuminate the interconnectedness of all species on the planet through sound and visuals. Douglas Soltis said he was inspired to use art to educate viewers about the Tree of Life while in Mexico with Pamela Soltis, also a distinguished professor and curator at the Florida Museum and director of the UF Biodiversity Institute. The Soltises contacted Mestaoui and began building a core team to work on the project, including Guralnick. The “One Tree, One Planet” projection and app will soon make their way to other cities in the U.S., with the next event scheduled at the Atlanta Botanical Garden on April 11-12. “Everybody doesn’t have to do everything – not every challenge, but if everybody does a little bit, it makes a difference,” Douglas Soltis said. For more information about the app launch, visit www.floridamuseum.ufl.edu/event/otop. For more information about the “One Tree, One Planet” project, visit www.floridamuseum.ufl.edu/onetree.